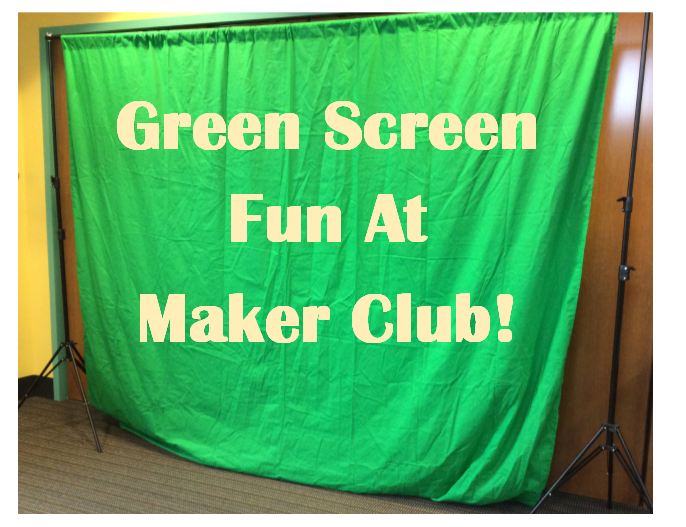 Inspired by Karen at Teen Librarian Toolbox, I started using a green screen at our last maker club. The kids and I had SO much fun. I wanted to share a little bit about what we did. Our green screen set-up is available from Amazon and comes with black, white, and green backdrops. It's not professional quality but it works great for my purposes (green screen photography but we also use this setup to run photo booths at a number of our programs). I did like only having one iPad because my main rule for the green screen station (there were 4-5 other stations) was that only one kid could move the screen over themselves at once. I didn't want anyone to pull it down, although it is pretty sturdy. I think we will try using a bench and pulling the screen over that to simulate flying next time!